The most common use of a trailer winch is to help you lower or raise your boat into or out of the water. This is typically done while your trailer is backed down onto an inclined boat launch. Winches are usually mounted on a separate winch stand on the tongue of your trailer. A spool or reel is wound with anywhere from 20 to 50 feet of strap, cable or rope, with a hook attached at the end of the cable. When the hook is attached to the bow of the boat the operator can crank the winch to either slowly lower the boat down into the water backwards, or lift the boat up out of the water and onto the trailer. Crank turned manual winches use mechanical advantage to multiply your applied force, letting you overcome friction and gravity to pull a heavy boat with relative ease. Good winches also include a ratchet to stop and hold your boat at a variety of points along the trailer, keeping it from sliding back into the water. 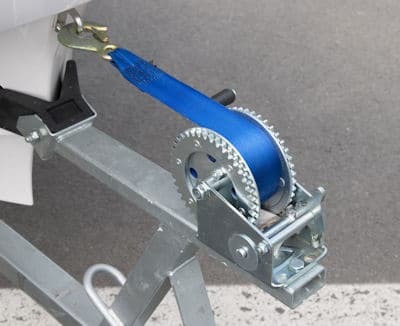 With just simple gearing and a lever that is usually only 12 inches long a person of average strength can pull a boat weighing over 2000 pounds up onto their trailer. And bigger manual trailer winch models employ more complicated gear ratios, further increasing your pull strength. Some models even offer two speeds for extra power. If you are worried about working a manual winch, or have a really large boat, you might want to consider an electric winch. Electric winches use powerful direct-current motors that are run off of the towing vehicle’s electrical system, and usually employ a reduced-stretch steel cable to do the pulling. Electric motor pull capacities range anywhere from 1500 pounds up to over five tons for the beefiest models. Read our review of the top 12-volt electric boat trailer winches here. Operating Environment – Are you boating in freshwater sources like lakes and rivers, or will you operate in saltwater? The answer to that will affect whether you get a winch that is galvanized, powder coated, zinc plated, or aluminum to resist corrosion. For saltwater exposure many models list how many hours of exposure they can tolerate. Load Capacity – Winches are not rated by the length of your boat, but rather by their weight capacity. To choose the proper trailer winch you need to calculate the total weight of your boat, motor and other equipment. The heavier and longer your boat is, the more powerful winch and longer cable you need to properly load and unload it. The rule of thumb with winch capacity is to choose a model with a rating at least three-quarters of the combined weight of your boat plus motor, fuel, and other equipment. Any special considerations for your boat and where you typically launch it should also be factored in. Overly steep ramps affect winch load, as do the use of carpet-covered wood bunks rather than rollers on the trailer. The added incline and increased friction mandate greater winch capacity to properly handle your boat. For heavier duty work you probably want a two speed winch. Larger winch models give you both you both a fast speed – like 5:1 for pulling in your boat quickly, along with a second lower speed for extra mechanical advantage. Some go as low as 15:1 or more, to maximize the amount of weight you can pull in. And if a two speed manual winch isn’t powerful enough for your needs, variable speed electric winches with higher gear ratios (some go as high as 450:1) can successfully load boats weighing nearly five tons. Additional Braking? – For heavier boats you will likely need more control when lowering them into the water. This is especially true for steep launch situations. In those cases an electric winch that includes a power out function is your best option. Rather than just using gravity and a free winch spool to control your launch, the power out feature uses the motor to let the spool out slowly. Most also have a clutch you can engage for gravity free spooling, so you get the best of both worlds. Rope, Strap, or Cable? – Steel cables are the strongest, and most (but not all) electric winches use them. Cables have been known to snarl (think fishing line), so better quality cable winches utilize a level winding mechanism to prevent cable fouling. For very heavy loads cable winches give you the ability to add a pulley block between the winch and boat that will nearly double the winch’s weight capacity, and at the same time cut raising and lowering speed in half. For lighter boats, lesser sized manual winches nylon straps (similar to auto seat belts) or polypropylene rope instead of steel cables. An electric winch will draw significant electrical current when pulling your boat. Your vehicle’s battery will provide the power, but you will need to add a dedicated circuit to the back end of your towing vehicle. Electric winch manufacturers usually include a wiring harness, but it still will need to be installed. It isn’t terribly complicated, but doing it incorrectly (like putting the wires too close to the exhaust or suspension) could damage the wiring. Of course it would be great to get your vehicle up on an auto lift to run the wiring, but it still can be done without one if necessary. If you don’t feel capable of installing it yourself it should be a relatively simple job for a mechanic.